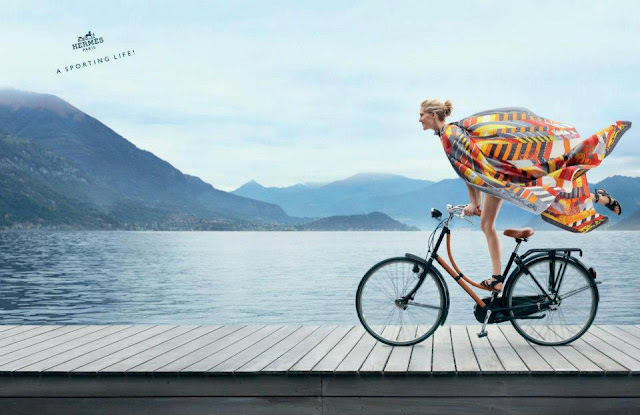 There are countless fashion brands who have jumped on the Cycle Chic bandwagon with their photo shoots over the past 6 years. But this photo from Hermes is definately one of the loveliest. My son and I do this all the time and people have done this since the bicycle was invented. If you're afraid of riding a bicycle, then buy a bus pass. Around 3500 Euro for an ordinary Batavus and some orange paint ... With Hermès' pedigree, it must be the saddle that makes the difference. @joh - the orange paint you speak of is actually leather wrapped around the frames. Spændende - har lige fundet bloggen. Kan lide at cykle med stil. Elsker Hermés og at cykle. I agree. Besides loving the bike, I have to say I love the practical shoes. Fashion and function combined warms my heart. Not to mention, yes, she is beautiful, and so is the scenery. I'm okay with all of it - beauty is beauty! Damn the buses! I have a bike. But,unfortunately I have no son. Maybe you all know it, but I strongly recommend the worldwide cycling atlas!